Most people in Wisconsin know at least one or two innovative people whose work has transformed our state and the world in some meaningful way. These people—doctor, painter, or poet—are our friends, colleagues, and neighbors. They are part of the fabric of our state, and as such their work helps define who we are as a people. Through Fellowship, the Wisconsin Academy seeks to recognize and acknowledge the best and brightest our state has to offer. To reach this pinnacle of Academy recognition, Fellows will have demonstrated high levels of achievement in—or at the intersections of—the sciences, arts, or letters, and will have shown a lifelong commitment to civil discourse and public service. It is important that we recognize and celebrate the Fellows, of which the Wisconsin Academy currently has eighty-four. But often in recognizing these Wisconsin treasures, we get caught up in lists of accomplishments, publications, and projects only to forget that, at heart, these are people who love their work and their state. What was your first reaction to being named a Wisconsin Academy Fellow? Chapman: I was amazed, and terrifically thrilled, to receive [Fellows Selection Committee Chair] Linda Ware’s call during my January writing retreat at the Banff Centre’s Leighton Studios. (I might have thought it was an ordinary call if she hadn’t titled her earlier email “Nota Bene.”) The red squirrel outside my window was the first to be told, and the mule deer, and then I called up Will, my spouse. I love the work that the Academy does in its lecture series on issues affecting Wisconsin and the world, and I love its emphasis on integrating the sciences, arts, and letters, and so I felt a great honor to be included among the distinguished Fellows chosen. Magnuson: My first thought when receiving the call about being nominated as a Wisconsin Academy Fellow was that of appreciation to my colleagues for initiating and preparing my nomination and, to the Academy, for choosing to recognize me. Leary: I was surprised and honored. Although the American Folklore Society was formed in 1888, making it one of the nation’s oldest “learned societies,” folklorists have not fared well in the academy. This may be because we are few in number, work across and between established disciplines, and have always focused on the “low culture” of indigenous peoples, immigrants, regional communities, and workers. Since I’m a folklorist and a Wisconsin native, it’s very special to be a Wisconsin Academy Fellow. Rohatgi: I was very humbled and felt very honored when I heard about being named as Wisconsin Academy Fellow. I was happy that my contributions were recognized by people of the state of Wisconsin where I live and work. Temple: I was delightfully surprised when I was notified because I was unaware that colleagues at the Aldo Leopold Foundation, The Nature Conservancy, and UW’s Nelson Institute had nominated me. That the nomination came from three groups with which I have worked for many years was especially gratifying. 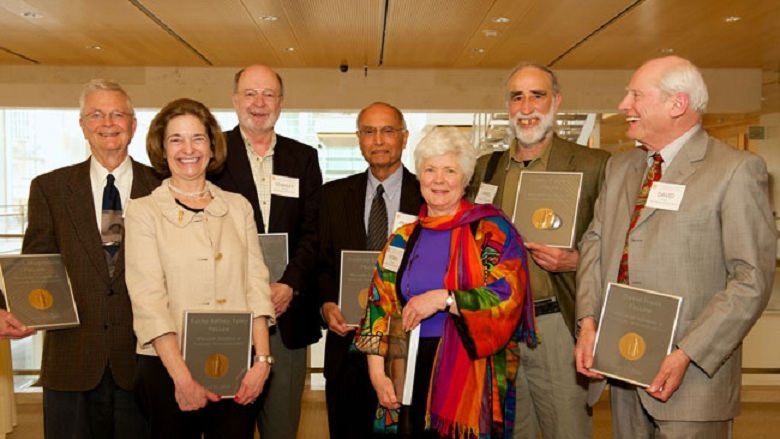 And it was an honor knowing that I was joining other Fellows whose work I have long admired. How have you used creativity in in your field? Does your work intersect the sciences, arts, or letters? Chapman: Poetry requires being open to silence and the unexpected as you write, being inventive about form, music, and language. I’ve been particularly interested in collaborating with scientists and artists in my work, integrating the three domains (or collaborating with my own cognitive scientist and beginning artist sides). Examples include Images of a Complex World: the Art and Poetry of Chaos, pairing my poems with physicist J.C. Sprott’s explanations and fractals; my just-out poems about climate change, One Hundred White Pelicans, and my recent chapbook Dappled Things with poems paired with photogravure artist Peter Miller’s etchings of Asian landscapes. Kelsey Foley: Creativity, by necessity, touches just about every aspect of my work, more so now than ever. From stretching limited resources to program planning, creativity has become not only a way of life, but also a touchstone. As the director of the Leigh Yawkey Woodson Art Museum, the “art part” is always front and center when considering exhibitions as well as additions to the collection. Because the collection focuses on art in nature—and the Museum’s flagship exhibition, Birds in Art, is an annual undertaking—the science of ornithology is integral to our thinking and decision making. Also, writing and editing are daily endeavors, whether for a funding proposal, gallery text panel, or the Museum’s weekly blog, Woodson Wanderings. I’m often amazed by how much writing is part of day-to-day art museum life. Frank: The organizational goal of American Players Theatre is to foster an environment in which creativity can be recognized and flourish. Creativity is, it might be said, the goal itself. The tools to achieving this include method and logic, the work of scholars over the ages. Magnuson: I enjoy science and numbers and ideas. The College of Letters and Science and Center for Limnology at UW–Madison have been a great academic home with the breadth of the sciences they represent. Being interdisciplinary in approach is important to me. I appreciate art, music, and literature. Occasionally I have been able to help link the natural sciences with the humanities and social sciences. I did some of this work on the Wisconsin Academy’s Waters of Wisconsin project and the Center for Limnology’s Long-Term Ecological Research Program, as well as for a project of the Center for Biology Education called Paradise Lost: Art and Climate in the Northwoods. Leary: I do empirical ethnographic research using field recordings and photography to document the folk cultural traditions of community-based artists; then I transform that documentation, often collaboratively, into festivals and such publicly-accessible productions as compact discs with accompanying notes, radio programs, films, and exhibits. In essence, I’m a humanist who combines scientific methods with aesthetic sensibilities to present and ponder the vibrant, varied, complex folklore of the Upper Midwest’s diverse peoples, whether it be Ole and Lena jokes or polka music, homemade decoys, or workplace customs. Rohatgi: Creativity has been an essential component in addition to hard work, and perseverance in doing whatever little I have been able to do. My main work has been on scientific research, but I have also spent considerable time examining and writing about the impact of science on society. Temple: As a pioneer in the emerging field of conservation biology I realized that preserving the world’s biodiversity was an enormous challenge that required guiding principles and enabling methodologies from a wide range of disciplines. Although I am an ecologist, I sought working partnerships with individuals and organizations that sincerely embrace this approach, among them the three organizations that nominated me. How does your work influence the community? The world? Chapman: Some say that poetry makes nothing happen, but I believe that poems go out into the world and lead their own lives in other people’s lives. Occasionally reports come back: a poem will appear in a book or anthology, will receive a state or national award. Some lines of mine can be found by the giraffes and the African cichlids at the Milwaukee Public Zoo, in a sixty-foot mural at Everglades High School in Florida, and on the back of an Australian singer’s jazz CD. Poems have been set to music and sung both here and in Canada; included in the nationally distributed meditation program, Quest; and toured the city and state in the Epidemic Peace Imagery exhibit that I helped organize with Russell Gardner. Some will appear soon in Madison’s Green Cars, in a project of HYBRID poetry and photographs organized by Thomas Ferrella and Sara Parrell. More certain influence, perhaps, has come from my thirty years of research and teaching in children’s language development and disorders at UW’s Department of Communicative Disorders; in teaching some one thousand outstanding clinicians and a number of now-eminent doctoral students; and in carrying out longitudinal research on the language skills of children and adolescents with Down Syndrome at the Waisman Center. Kelsey Foley: My Woodson Art Museum work is largely audience—i.e., visitor—focused, and our audiences comprise the immediate and surrounding communities of north central Wisconsin as well as the entire state and the Upper Midwest. In terms of Birds in Art, the reach is international because this juried exhibition is open to artists from around the world. In addition, after the exhibition’s fall debut at the Woodson, sixty artworks travel to multiple venues across the country, thereby extending the reach of the Museum as well as serving as a Wisconsin cultural ambassador. Frank: The magic of the performing arts is that they take place within a community of participants: the audience. It is the collective sharing of the experience that makes them so potent. Speaking of community in a broader sense, it might be said that APT’s history has been one long dialogue between this theater and a community that was midwife at its birth and which sustains it still today. The theater’s influence has continued to spread; some fifteen thousand people from out of state are attracted to APT every year. Magnuson: When I became an emeritus professor in 2000, I felt it was time for pay back to the community where my wife and I had lived since 1967, where our children grew up. I began to apply myself more selectively to the local community, doing more for groups like the Dane County Lakes and Watershed Commission and the Wisconsin Initiative on Climate Change Impacts. Correspondingly, my national and international contributions declined somewhat. Leary: In 2000 I helped found the Center for the Study of Upper Midwestern Cultures (CSUMC), dedicated to research, archival collections, and public programs focused on the languages and folklore of our region. We’ve worked with state agencies, local museums, ethnic/immigrant groups like the Sons of Norway and the Hmong Mutual Assistance Association, American Indian tribes, farmers, loggers, labor unions, hunters, and more in Wisconsin and the surrounding region. Scholars and citizens from Europe especially have been attracted to our projects featuring the talk and traditions of Wisconsin’s Baltic, British, French, Germanic, Irish, Mediterranean, Scandinavian, and Slavic peoples. Meanwhile films like The Art of Ironworking, produced with students from our fieldwork with Local 383, has attracted more than 55,000 viewers on YouTube, including ironworkers from locals throughout North America. Rohatgi: My research has been directed at revitalizing the materials manufacturing industry in Wisconsin and training our workforce for the future because I firmly believe that manufacturing is very essential to the economy of Wisconsin. Wisconsin has already become a leading producer of cast metal matrix composites, an area of my research. My work on lightweight castings of advanced composites has had an impact on the entire U.S. and the rest of the world in reducing energy consumption and pollution. Temple: My students, colleagues, and I have worked to save dozens of endangered species and the habitats on which they depend, in Wisconsin and around the world. It is enormously satisfying to know that none of the endangered species I worked with has gone extinct, and most are either recovering steadily or have come off the endangered species list. There are important natural areas in Wisconsin and elsewhere that have been protected as a result of efforts to which I contributed. These are among my most tangible and, I hope, enduring impacts. What is your favorite Wisconsin tradition/pastime? Chapman: I love hiking the prairies and Wisconsin River uplands, canoeing the rivers, snowshoeing in winter, contra dancing year round, singing folksongs, sitting on the Union Terrace watching the lake, gardening a plot in the Eagle Heights Community Gardens. Kelsey Foley: Badger athletics! Although I’m not a UW–Madison alumna, our older daughter is. So, by association, I feel a kinship with the Badgers. It’s been fun to cheer on the football team in the fall, and this winter’s March Madness run was terrific until the heartbreaking Final Four defeat in the last seconds of an exciting and valiantly played game. Frank: Tradition: Good beer. Pastime: The same—in good company. Also, the City of Madison and all it has to offer; music, theater, museums and a vibrant, thoughtful, liberal and cosmopolitan community that is a profound pleasure to be a part of. Magnuson: I enjoy being out in the diversity of nature, gardening and watching my garden grow and bloom; I enjoy capturing through photography my glimpses of nature, family, and people. Leary: I grew up a “jackpine savage” in northern Wisconsin, literally between two lakes, a woods, and a swamp. I love working and playing outdoors in all seasons, maybe with a Brewer or Packer or Badger game on my headphones, and some good local food and a microbrew or two at day’s end. Rohatgi: I love to attend a lot of cultural activities in Wisconsin including parades, ethnic festivals, state fairs, theater and music, watching sports and rooting for Wisconsin teams. Temple: Wisconsin has a long, proud tradition of leadership in the field of conservation, with an impressive legacy left by Wisconsin greats like Aldo Leopold, John Muir, Gaylord Nelson, and others. Because of their efforts, I have been able to enjoy exploring the wonderful diversity of species and habitats Wisconsin supports. I hope that Wisconsin’s tradition of stewardship of its rich natural heritage continues so future generations can enjoy the same opportunities to discover and enjoy nature. Any additional thoughts or reflections on what living and working in Wisconsin has meant to you, personally? Chapman: My whole life since graduate school at Berkeley has been spent in Madison: it has meant living in a wonderful set of intersecting communities of poets, artists, scientists, teachers, nature-lovers, singers, dancers, gardeners, arts-lovers of a broad range of ages and interests. I feel extraordinarily fortunate in my writing colleagues, my professional colleagues, and my friends. Kelsey Foley: I grew up on the East Coast and I have lived on the West Coast. My determination is that the Midwest—and specifically Wisconsin—is the best. The reason is the people. Wisconsinites—our friends, my coworkers, and statewide colleagues—have an exceptional work ethic in addition to being genuinely thoughtful and caring. Frank: Wisconsin has become home to us. We wouldn’t consider settling anywhere else. Who minds a little snow? Magnuson: I like it here! One of my beliefs is that science has an important role in the formulation of public policy. Simply put, policy development advised by science is likely to be relevant longer and less hindered by undesirable surprises. Such policy should contribute more to a sustainable future than policy without, or excluding, the benefits of science advice. Leary: My parents were small town journalists who valued travel, learning, creative expression, egalitarianism, and civic responsibility. Curious about and committed to Wisconsin, and to its place in the nation and the world, my dad championed liberal populism through newspaper editorials, while my mother was a lifelong civil rights supporter. Following them, my commitment has been to cultural democracy, to making the rich lives and eloquent expressions of ordinary people better known, to Wisconsin’s intricate connections with the wider world, and to the intrinsic worth of its people’s varied and common cultures. Rohatgi: Living and working in Wisconsin has allowed me to devote my research to manufacture of advanced metals since Wisconsin is a leader in this field. On a personal front, it has allowed me to have a wonderful family life since Wisconsin is a great place to raise children. I had moved a lot before coming to Wisconsin, but have stayed put in Wisconsin for the last thirty years. Temple: I was very fortunate to spend my career at the University of Wisconsin in the academic chair previously occupied by two of my personal and professional role models: Aldo Leopold and Joe Hickey. Knowing that history motivated me to live up to the high standards they had set while occupying the chair. I don’t think there is another university position in my field that carries such a weighty legacy or any other state in which that legacy is so widely respected. The Wisconsin Academy would like to extend a special thank you to our Fellows for generously sharing their personal reflections on Fellowship. We hope our members and readers of this magazine gain a greater appreciation for them beyond their curriculum vitae and, in doing so, perhaps better understand what makes them Wisconsin Academy Fellows. From the time poet Robin Chapman was eight she has written poetry, returning to it in 1980 in Wisconsin with the commitment to meet with her writing groups weekly, including in her poems topics of daily life, nature, child language, and science. David Frank (and family) moved to Wisconsin when he was appointed Artistic Director of the American Players Theatre in the summer of 1991. James P. Leary is the Birgit Baldwin Professor of Scandinavian Studies, a professor in the Department of Comparative Literature and Folklore Studies, and a co-founder of the Center for the Study of Upper Midwestern Cultures at UW–Madison. John J. Magnuson is Professor Emeritus of Zoology and Limnology at the Center for Limnology, UW–Madison. Pradeep Rohatgi received his undergraduate degree from IIT-BHU and his Doctorate in science from MIT in 1964. He was a professor at the Indian Institute of Science and Indian Institute of Technology, and also served as the Founder and Chief Executive of two National Laboratories in India. Stanley A. Temple is the Beers-Bascom Professor Emeritus in Conservation in the Department of Forest and Wildlife Ecology and former Chairman of the Conservation Biology and Sustainable Development Program in the Gaylord Nelson Institute for Environmental Studies at UW–Madison.